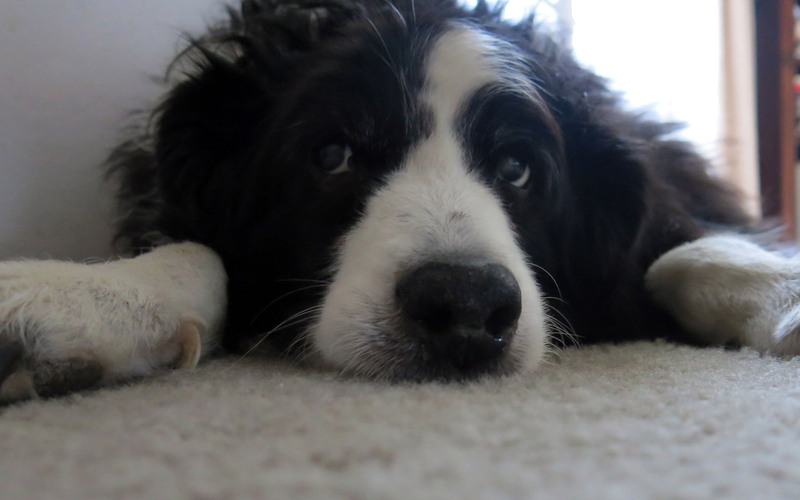 Greetings and salutations, everyone; yes, once again it is I, Chess the purebred border collie, filling in for the guy I live with, and here today to bring you some news about the weather. Like we hardly ever talk about that. You may remember me from such weather-related posts as “Weather And Other Complaints” and “Change In The Weather”, among so many, many others. Here I am in a characteristic pose. Looking rather pathetic and sad, don’t you think? I’ve been feeling kind of crummy lately, and so I thought looking extremely sad would add to things. I did have quite a bit of steak this morning, and it was really good. One reason why it was so good is that the guy I live with finally realized how to cook steak the right way. He fries it in butter, until it’s just cooked, and then boils it. It comes out soft and tender. I ate more steak this morning than most times I’ve had it. And then, when I started looking so totally sad that it redefined sadness, I got some of this, and let me tell you, this is really, really good. Even the cow is smiling. Ordinarily, of course, I wouldn’t get things like this, just regular low-fat cheese, but I was feeling icky, and so the guy I live with took pity on me, and gave me some. Not enough, but some. He got himself something in the mail, too. Friday, I think. “Illustrated, that’s the best way”, he said, and that’s probably true. My mommy loved books like this and so the guy I live with is carrying on the tradition of getting big, heavy illustrated books, though he doesn’t take them outside and read them while drinking coffee and generally hanging out with me and my buddy Slipper. Instead he just leafs through the books and gasps, now and then. To my considerable relief I learned that there are no plans to travel the Silk Road, which is just as well, because there probably aren’t that many places to get steak boiled just the right way. And fancy French cheese. Above all, though, my bed is here at my house. Oh, right, the weather. 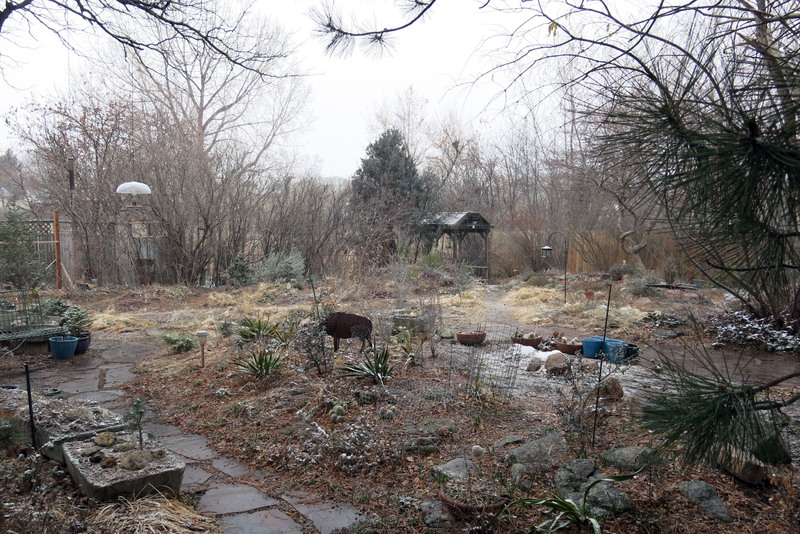 It’s snowing here. The guy I live with tells me we’re supposed to get a foot of snow. (30 cm.) That’s a lot of snow for February, and maybe if the weather people didn’t say what was supposed to happen it wouldn’t, but everything is completely out of our control. Which is okay. I know saying “back to winter” is kind of silly, since winter also means nice weather here, but I think you get the idea. The guy I live with says if our weather were a person, they would be in the loony bin. He’s so funny. It isn’t going to be very cold, in any case. I think I could say a lot more, but I’m not sure about what, exactly, so I’m going to sign off now, and do the sort of thing you do on a gloomy, snowy day. Oh, poor dear Chess, I am so sorry you’re feeling kind of crummy lately. Good to know you can rally enough to summon a pathetic-enough look to earn you cheese, the good stuff. 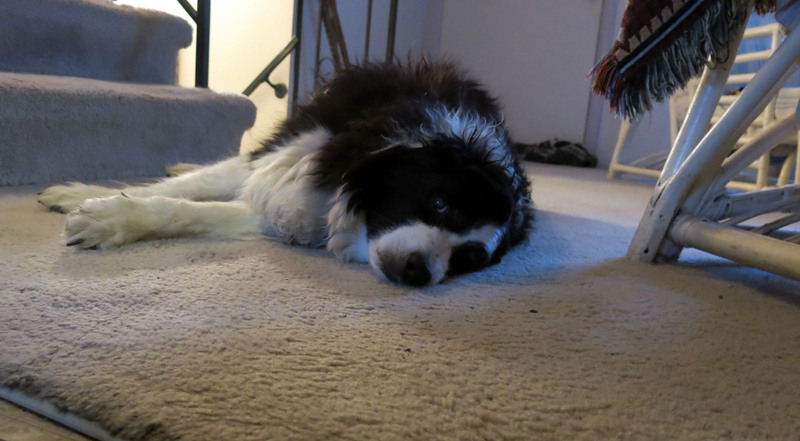 I’m also relieved to learn the guy you live with progresses in his cooking-for-the-purebred-border-collie skills. 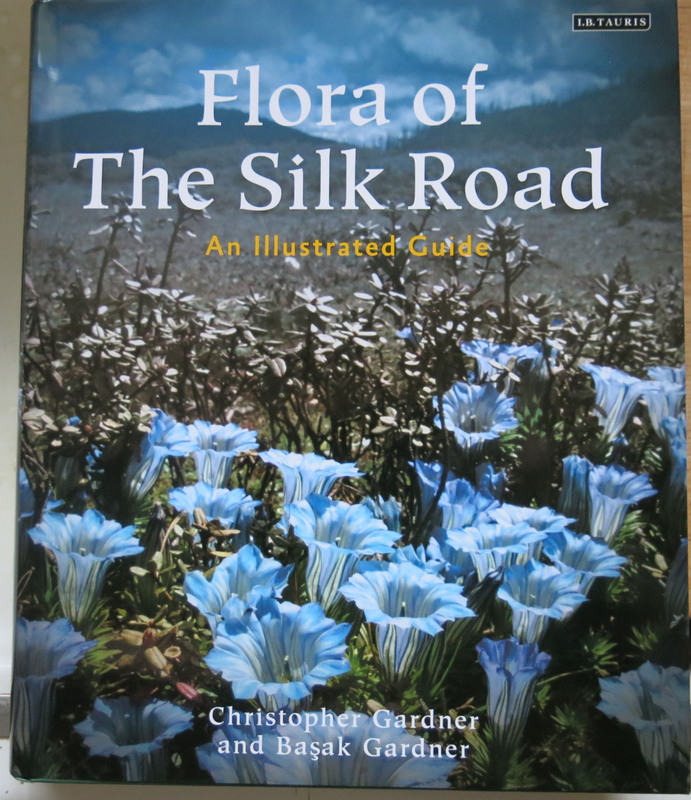 The 2014 pub date Flora of the Silk Road shows the book is recent, yet the cover photo recalls the nineteenth century while being quite excellent in showing flora and depth of place. The guy’s gasps as he reads I hope does not disturb your napping. It may be gloomy and snowy in your part of the world, but here skies are blue and the temperature balmy. So it was with some disbelief we and the dogs discovered five minutes away at Dog Park fog obscured the sun and trees dripped moisture. Now, back home, all is balmy once more. Humph, climate change. Dream happy dreams, good Chess. Thanks; maybe you should try boiled steak some time. If you brown it first, then it has some flavor. 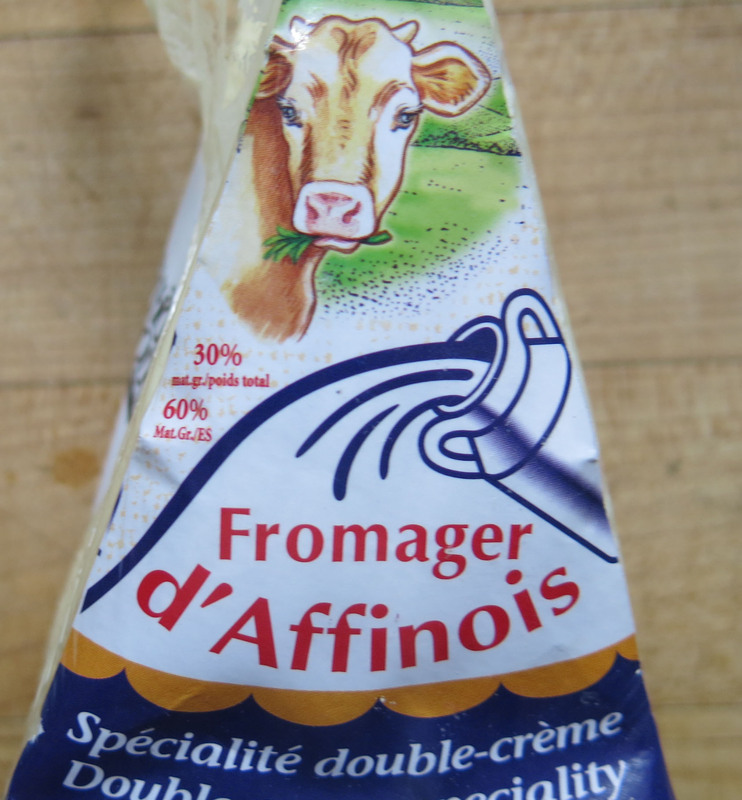 The guy I live with actually did buy the Fromager specifically for me. He left me lying by the back door (closed) when he went to the store, but when he came home, there I was at my favorite place, under the living room window, where my picture was taken….before I got to sample the cheese. Which by the way is more like soft butter. I guess that’s Gentiana sino-ornata (or similar) on the front cover. Unfortunately we no longer have a Peat Garden in which to grow such things. The snow is okay. 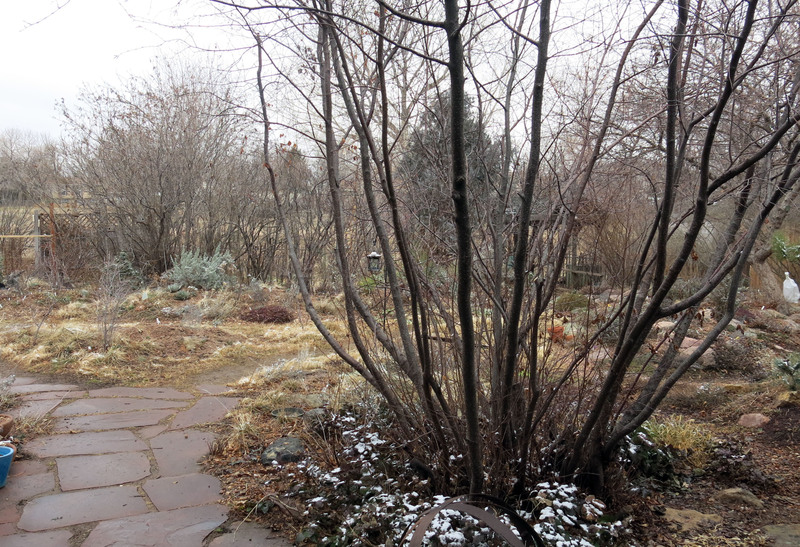 At this time of year the snow melts, instead of evaporating, and so it’s watery goodness for the garden when it warms up, which it will, in just a few days. Boiled steak? hmm. Tonight: Toronto cocktail (David Lebovitz’ blog) with three cheeses, chicken marsala (David Lebovitz’ blog), egg noodles, vegetable mélange. Then peanut butter and chocolate in vanilla ice cream. Read my backlog in David Lebovitz’ blog tonight, and he advocates via Susanna Trilling grasshoppers (chile, pumpkin seed, garlic) in guacamole. hmm. Stick with the boiled steak and fromage, dear sweet Chess. Thanks; steak and cheese is pretty good. The guy I live with got some cheesesteak soup from Whole Foods and he, as a failed vegetarian, said it was really good. I hear that D.L.’s chocolate biscotti are excellent. The guy I live with was a biscotti factory a few winters ago, and they were piling up all over the kitchen. He also says that you make guacamole with three avocadoes, one tomato, seeded and chopped, one jalapeno, seeded and finely chopped, and two tablespoons of minced red onion, either washed in cold water or soaked in cold water for fifteen minutes, then patted dry. Salt and juice of half a lime. No cilantro, no garlic. And no weird stuff. Hi Chess, all this talking of food. My mum makes a really simple, quick guacamole with avocado, lemon juice, tabasco sauce and a dollop of sour cream, yum. Sorry you haven’t been feeling well but a correctly cooked steak and a cheese treat makes the world of difference doesn’t it. I don’t get steak very often, mainly chicken wings but I think there is steak coming in a week or so when my mum remembers to defrost it. That is a beautiful looking book, I suppose there will be more ordering of seeds soon. I’ll be waiting to see the foot of snow in the coming days blanketing your garden but those poor little cyclamen are going to be buried. Like you off for a nap before my dins. Food is really excellent. I’ve been ultra-hyper-totally picky recently, which has frustrated a Certain Party, but whatever. Lime is what they use in Mexican cuisine. I think because the lime tolerates more cool weather than the lemon, and northern Mexico can get pretty chilly in the winter. (Not like here. Almost no place is like here.) 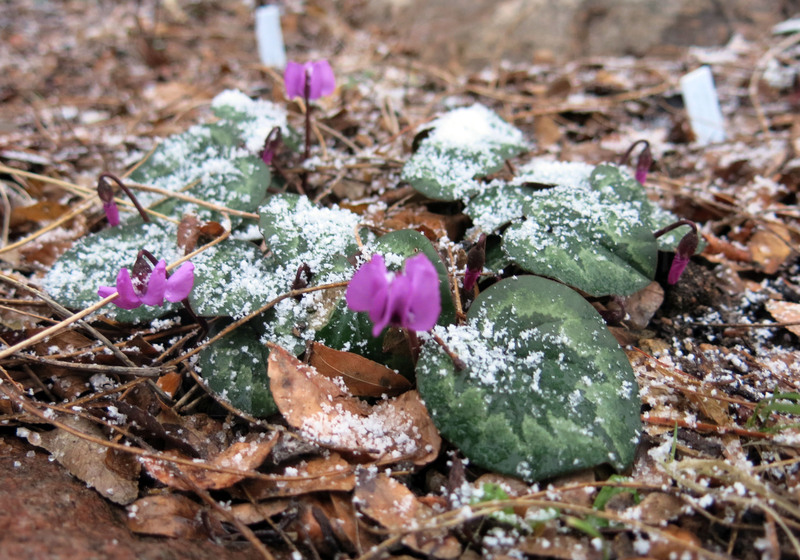 The cyclamen will be buried, but in a blanket of nice, insulating snow. It’s not supposed to get hugely cold, though. –8 Celsius, maybe. Or snow as much as they said at first. It is a beautiful book, very heavy, too. I tihnk that book will be very popular with serious ‘plants’ people. I bought it a couple of weeks ago and actually read it (not just looked at the pictures). Now there are more plants I want for the garden. I’m sure the guy you live with will want some of them too. Yes, dearest Chess, until next time.